If you are an angler who is used to fishing on a boat, then you must be familiar with trolling motors. In fact, they are very helpful for your fishing. A fishing boat will need the best trolling motor that can help it in heavy situations. As I said, to choose the right trolling motor, you have to have good knowledge, and this is also what most of you are lack of. In reality, this results from the absence of credible online information resources. That’s the reason why before moving onto how to choose the best motor, I want you to know about them a little bit. First, you need to know that a trolling motor is. It is a self-contained device including an electric motor, controls, and propeller. It is specifically designed to be affixed to your boat, either at the stern or bow. 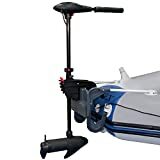 Also, if a gasoline-powered outboard which is used in trolling, is not the vessel’s main source of propulsion, it can be considered as a trolling motor. A trolling motor is often lifted from the water to reduce drag in case the main engine of your boat is in operation. Keep in mind that a true trolling motor will never compromise on performance. Whether you are planning to use one for a whole day or an instant, it is still going to deliver maximum power. In details, the performance of a trolling motor depends on the weight of your fishing boat as well as people on it. A good trolling motor is a motor that is sensitive to even little changes in steering and will react as soon as possible. In some cases, the driver needs to change the steering suddenly; a good trolling motor will probably turn in no time without any problem. In general, remember that the steering should be easy going and smooth enough. There are two types of steering: hand and foot. If you have bought a hand steering, then you need to check the sensitivity as well as durability. However, hand steering is usually responsive and sensitive. On the other hand, if it’s a foot controller, then it should be receptive. Also, a foot controller should feature all the speed controls and steer on foot. If you have a trolling motor, then it is likely to be underwater a lot of times. Therefore, if it is not corrosion proof, particularly in salt water, then its parts and shaft which are under the water will be damaged. And this will have a bad effect on your motor’s performance and life. Another important factor when it comes to benefits of a trolling motor is speed. A good motor should have various speeds, backward and forward. Commonly, you need to go to the location. Thus, you can give the full throttle. The trolling motor’s speed needs to be high enough. Besides, there should be variations of speed. Well, the way a trolling motor works is simply based on the principle of electromagnetic induction. First, let’s mention the main parts it has. In general, there are parts such as a motor, propeller, tiller, shaft, steering, mounting, and battery connectors. In fact, a trolling motor works in the same way as a normal motor. Once the battery is connected to the battery connectors, the current will pass through the wires and go to the tiller. This tiller will control the steering and speed of the motor. In case of the foot, speed and steer controls are on the foot panel that comes right after the battery connectors. The term “thrust” is defined by the pound force that the trolling motor produces. It is the most important factor you need to consider. In details, the thrust will determine which range you are going to buy. Different motors have the same thrust, so you just need to determine the right amount that should drive the boat. Trolling motors come in 3 separate power systems such as 12, 24, or 36 volts. To put it simply, a 12-volt trolling motor is a basic type of motors. Also, it has low thrust as compared to the two other types. If 24 or 36-volt batteries are connected to 12 volts, it will probably give you better thrust as well as run time in the water. Therefore, if you want to go fishing or adventure, you’d better buy one with a high battery volt system. Additionally, a 24-volt or 36-volt system can allow you to fish longer on the water. This is because those systems can draw lower amps when offering increased thrust for more power. When it comes to buying the best trolling motor, you also need to consider different types of them. In fact, there are two types of trolling motors in the market for you to choose as bow mount and transom mount. A bow mount motor is a motor which is mounted on the front, and it is specifically used for long boats. Besides, if you are going to use a boat for heavy purposes, then a bow-type motor can be a good choice. Furthermore, when it comes to steering, this motor type is very sensitive, and it also has better control. However, if you want to install this one, there must be sufficient room up front and a mounting plate or bracket. This way, you can affix the housing. A transom motor is a motor which clamps onto the stern of your boat, and it works with every type of craft. If it is a small boat, dinghy or canoe, it is the best choice to buy a transom mount. The reason is that it can work very effectively for general trolling and positioning application (exactly what it is designed for). Remember that whatever you choose, having any trolling motor is better than nothing. If you’ve already decided to buy a bow mount motor, the next thing to do is determine whether to operate it by foot or hand. Even though both styles have their pros, you should try each of them to find what is the most suitable. With the foot control style, of course, your hands will be free, and it is also very easy for you to use. More importantly, a foot control motor can be used everywhere in your boat. However, one of the disadvantages of this style compared to the hand version is that there is more clutter on the pedal (deck). Also, there are more parts which are likely to malfunction and break. Besides, some models of this style have a slower response time. As for the hand control version, there is no clutter on the pedal, and it has a real-time response. However, a downside of this model is that your hands are not always on the rod. Moreover, it can only be used from the bow. Your battery should be able to hold a charge for a long time, or else, your boat will end up stranded without any power. Batteries are likely to vibrate to some extents. However, good batteries can keep this to a minimum. The less they vibrate, the less they are prone to malfunctioning. Remember to check whether a battery is spill-proof as it can prevent acid from escaping. Besides, they can also be mounted everywhere on the vessel. Thus, they’re very convenient. Shaft length is referred to as the length of a trolling motor. It should be the proper length for the boat, and you’d better care about the way it’s mounted. Actually, for a proper fit, most motors out there come in different shaft length options. Today, there are more high-tech motors which work very effectively; some even have gone digital. In details, the digital technology in some motors can easily control the speed and monitor vital components of the motor continuously. Trolling motors can be either controlled directly by foot pedals, hand or remote units. In general, total direction and speed control can be accessed from any of those options. Your fishing style will determine the control type you need to use. You should choose a trolling motor which can give you freedom with the technology tracking an exact contour or depth automatically. This way, you can keep the boat tracking on a line of the structure holding a big fish. Your choice of fish-finder can affect your decision on trolling motor. In fact, not every trolling motor can suit all sonar units. Also, not every model is available with built-in transducers. The built-in transducers will eliminate bad clamps which are trouble in heavy cables and vegetation running down your motor’s shaft. If you want to choose the best trolling motor, this is also a very important factor for you to take into consideration. Overall, it is essential that you buy a minimum of 2 pounds of thrust for every 100 pounds. 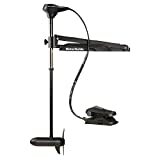 This Minn Kota Powerdrive generates 54 lbs thrust handled by the 48-inch shaft. The heavy-duty material can ensure durability. With the side-to-side steering foot pedal, this product is pretty helpful for you in smooth steering as well as portability with precise speed control knob. You can easily steer, change the speed, start and stop it only with the foot panel. Additionally, this product also features digital maximizer that can be very useful to get more charge from the battery. Specifically, with this technology, the battery can even run five times longer on a single charge. It only delivers the power the motor needs, no more, no less. Besides, the whole unit is waterproof, so you don’t have to worry about it getting damaged by the water. For more optimized experience, you should install GPS system on this one. Some complaints about the awkward design. The name of this product is enough to speak up its credibility as well as quality. In details, the 12-volt battery can produce a thrust level of 40 inches. Besides, 6-inch handle and 36-inch shaft and tilt twist tiller will ensure smooth steering as well as speed control. Like most of other trolling motors, this one features eight speed variations: 5 forward, three backward. Therefore, you can move your boat at any speed in every situation. Also, this product is a good choice for most inflatable boats which have built-in motor mount fittings. It includes a control panel along with the controls such as automatic escape weed control key, battery meter, overload protect controls and dry operation protect. That’s the reason why it is suitable for both saltwater and freshwater adventures. Besides, with the weed escape mode, it can easily get out of weed tangles. Deep cycle marine 12-volt battery with 60 amp hours rating. This one comes with full stainless steel and zinc hardware which give you maximum protection in case of salt water. This motor produces a thrust of 86 lbs which is quite good, along with the durable aluminum head with 6-inch telescoping handle. Like other trolling motors, this one feature eight-speed variations: 5 forward and three backward. 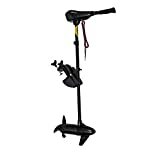 The 40-lb shaft is made of composite fiberglass, so it is very strong and durable with heavy duty nylon mount. Besides, you can easily adjust the shaft to the height. Also, the holder can be used for almost all boats, even inflatable ones. Compatible with salt water use. Can’t be left out in the rain as immersing the controls in water can cause damage. Overall, this MotorGuide trolling motor is the ultimate in rigidity, strength, and durability. This 12-volt motor features 55 pounds peak thrust which make it a quite powerful motor. Also, the 36-inch aluminum shaft is very easy for you to use and durable. Seven speed variations: 5 forward and two backward along with reversible motor head make this one a dependable but versatile motor. Furthermore, the stainless-steel hinge pins and aluminum alloy construction make this motor one of the most durable and powerful ones. The digital power management technology provides longer run time and precise variable speed control. In details, you can dial into the precise speed you desire. This product comes with eight different speed variations, five forward and three reverse. Additionally, it features strong and sturdy long shaft which can ensure long lasting durability and performance. You can move the telescoping handle easily and has six positions for you to choose. Another advantage of this electric trolling motor is that it can handle a load of even up to 7 people. The maximum speed that this one can reach is about 6.5 km/h. You can take your whole family out on the water, and I’m pretty sure that this one will not let you down. When compared to the price range, this one is quite a good choice. Therefore, I recommend this one if your priority is performance but at the same time, you don’t want to spend a lot of money. Supposed that you’ve already chosen the best trolling motor, the question here is: “Is it compulsory to have a boat license for it?” You don’t need a boat license to use a trolling motor. However, there are some regulations and laws surrounding the use of these units you need to remember. Well, in general, the laws related to trolling motors vary from state to state. Even in the same state, rules can vary very between different bodies of water. That’s the reason why it’s essential for you to know the regulations before you decide to launch your boat and go for a trip. Always carry distress signals, for example, flares. The vessels must be titled and registered, and you have to carry the registration card the whole time the vessel is used. Having navigational lights is important. You should carry a sound-producing device onboard in case of emergency. Always wear a PFD, this rule is especially strict for those under 13 years old. In conclusion, choosing a suitable motor is not easy for everyone because there are quite a lot of things to consider. However, I believe that if you read this article carefully and understand everything it covers, it’s not impossible. Hopefully, you guys found my guide helpful and can choose the right trolling motor for your boat.